A narcissist cares little for the emotions of others, and mostly focuses on herself. Narcissism: It's a dirty word loaded with other so called "ills" of social behavior, such as selfishness, preoccupation and vanity. But not all narcissism is bad -- a healthy amount keeps you focused on bettering and caring for yourself, and it also keeps you focused on handling your situation rather than expecting others to handle it for you. But when narcissism goes too far, it poisons both you and the environment around you. A healthy dose of narcissism means that you care about your appearance, your preferences and your identity. Everyone, to some extent, should have a sense of inner focus. According to Samuel López De Victoria, Ph.D, in an article from "Psych World," healthy narcissism requires the ability to focus on the self without creating increasing isolation from a community. When you begin to cut off others, you venture down a road of unhealthy inner focus. Unhealthy narcissism, according to López De Victoria, is usually created by a severe emotional wound or a series of traumatic events. These events cause you to become "stuck" in a childlike or adolescent mindset. How does this affect the workplace? 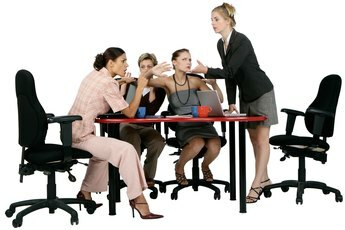 Jean Ritala, a workplace coach interviewed by "Computerworld," suggests that narcissists feel a need to control co-workers and their projects, and they can be manipulative. This means that a narcissistic coworker might spin facts and details to create an imaginary scenario that fits her idea of the way her environment responds to her. Regardless of that perception, this activity is damaging to the overall goal of mutual respect and productivity in a company. Further, a narcissist at work can have an adverse affect on the workplace culture because of the tone she creates. A narcissist, according to Ritala, tends to be anxiety-stricken and paranoid, patronizing, highly critical and can even attempt to set up others for failure in order to ensure her own safety and success. Most importantly, a narcissist has the ability to pretend to be innocent and charming in front of a manager or supervisor. This can become problematic, as coworkers experiencing distress with a narcissist might have difficulty showing the supervisor the problem at hand. 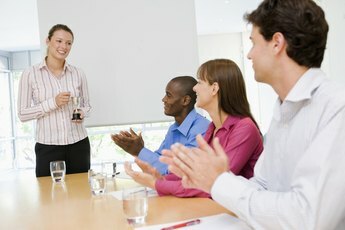 Narcissism is damaging to the workplace because it leads a person away from a goal of mutual success and toward an isolated reality of dominance. But that doesn't mean that you have to suffer. "Computerworld" suggests that having a psychologist or counselor within the company can help alleviate this problem. According to "Computerworld," up to one-third of the company will quit the division or actually move departments to avoid a narcissist if nothing is done on management's part to alleviate the problem. You can see the destruction and danger of a narcissist in the workplace. If you recognize these traits in a coworker and her performance, it's best to meet with a manager sooner than later. If the coworker can be redirected or guided toward a healthier path by a mental health professional, the whole company will benefit.